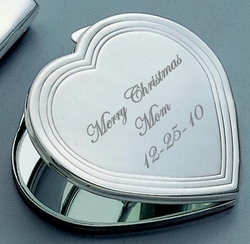 This silver heart mirror compact has an ultra-slim design that is very easy to carry and comfortable to hold in a pocket. Its beautiful silver finish looks fantastic with engraving. You can personalize both sides of this mirror compact with an engravement. Size: 2 3/4" x 2 9/16" x 1/4"